Ever wanted some money to help fund a project in your church designed by young people but found none? With the launch of the COSY collective special trust help is now at hand. Any young person, involved in the Church of Scotland, aged 25 or younger can apply. Applications from individuals or groups will be accepted. Who will decide where the money goes? The COSY collective team; this will be made up of 3 young adults, 1 from each of the areas (priority, urban & rural), the National Youth Assembly Moderator and two members of the Congregational Learning team of the Mission and Discipleship Council. They will try to ensure that the fund is equally split between projects in priority areas, rural areas and urban areas. When do we need to apply? Applications will be considered throughout the year. Given the timescales involved in making the final decision we advise that you get your application in at least 6 months before the proposed event/need. Each group/project receiving a grant will need to write a report detailing how the money was spent and what the outcomes were. This will enable us to celebrate what has happened and show the wider church how young people are being proactive in reaching out to folk in their communities. What happens once the money has run out? We are hoping that doesn’t happen! Assuming it is a success, we will be approaching the Mission and Discipleship Council to match fund the amount that the NYA raises in the future. 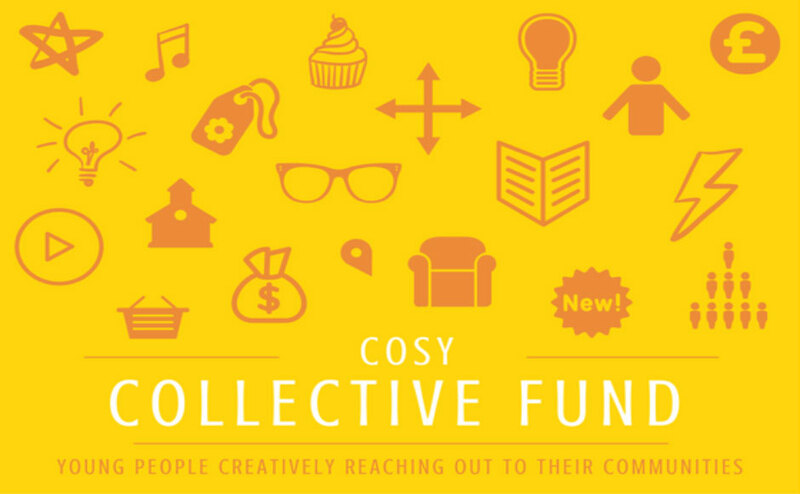 Of course any group or individual is able to donate money to the COSY collective at any time. Email Suzi Farrant if you need any more information, want to discuss if you are applying for the right sort of thing or for an application form. Youth Fellowship started back in November 2016 and we have had 3 members come every week without fail since we started. This may seem like a small number but what the young people have gotten out of YF has been so worthwhile. Youth Fellowship was run by myself and one of our volunteer youth leaders at Callander Kirk. The point of YF was to help young people in S3+ explore their own faith and expand what they know about faith and worship. We started by using the ‘Kleer Series’ which is supplied by Urban Saints Energize Resource site. The Kleer Series helps young people discuss their faith and looks at what may affect our faith in the 21st century such as the busyness of life and technology. We had some great discussions using the provided conversation starters but I feel we should have maybe written some questions of our own as well as using these. This may have helped bring the discussion to a more local level but we still had some great meaningful conversations anyway. One great part of YF was a section we called ‘Fellowship On Tour’! 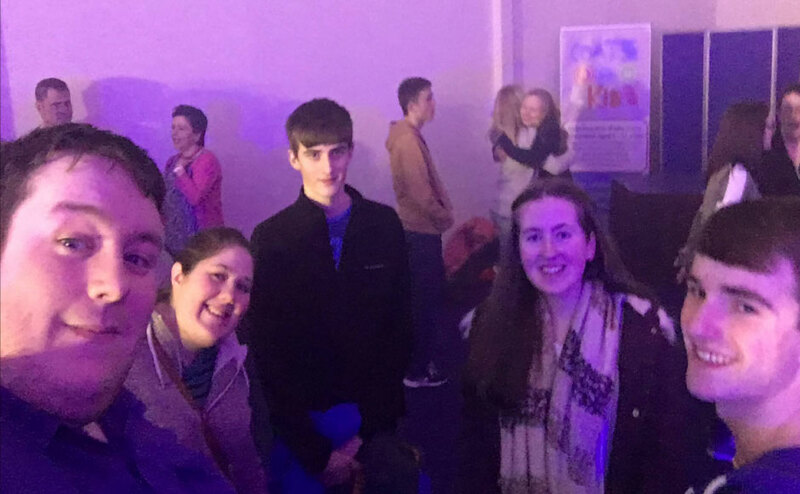 We travelled to some worship events in Glasgow and Edinburgh to show the young people that they are not the only young people at church, a real problem identified in rural churches. PowerPoint in Glasgow was a real highlight and the young people were so enthusiastic about faith after attending this and I was so proud as a youth worker to see them just loving God in a way they hadn’t experienced before! As stated in our application, most of our budget went on the meal that we shared each Friday night we met. We ended up using a local takeaway due to our kitchen being in use when we were meeting. I also purchased notebooks for each of us which were used every week to write thoughts and ideas during YF as well as prayer points throughout the week to bring to our meetings. The YF decided to ask the Church of Scotland if we could use some of our funds towards an Easter trip for the young people of Callander Kirk which shall take place on 6th April when we shall be going to look at church buildings in Glasgow before heading to do some high energy activities. Once this has happened the remaining money will be budgeted to hopefully continue YF until the Summer Holidays. We do hope that YF can continue to run and the YF have been invited to lead a service in the church which will be an amazing experience for the young people as well as myself. I would like to Thank You COSY Collective for awarding us the funding and feel it has been a very worthwhile group to start under the youth ministry of Callander Kirk. The Lanthorn Chapel was an unused former worship space attached to the Lanthorn Community Centre in Dedridge. Our idea was to transform this space into a welcoming place for young people to spend time in an informal, café-style setting. As the building is small and awkwardly shaped (triangular), we bought brightly coloured furniture which could be easily folded or stacked, so that the space can be set out in different ways. A pool table was donated, and we created an art-work of a coloured cross on the wall. The vestry was converted with the help of a church member into a kitchen and tuck-shop, and the old church PA system was fitted to the space to allow us to play music. The original plan was to open after the Easter holidays in 2015, but due to delays in PVG registrations coming through for helpers then taking us into the middle of exams, we decided to postpone this until after the summer holidays. We began by holding a ‘pre-launch’ drinks reception for members of the congregation so they could see what we had done. We launched the following week, after distributing leaflets to local schools. 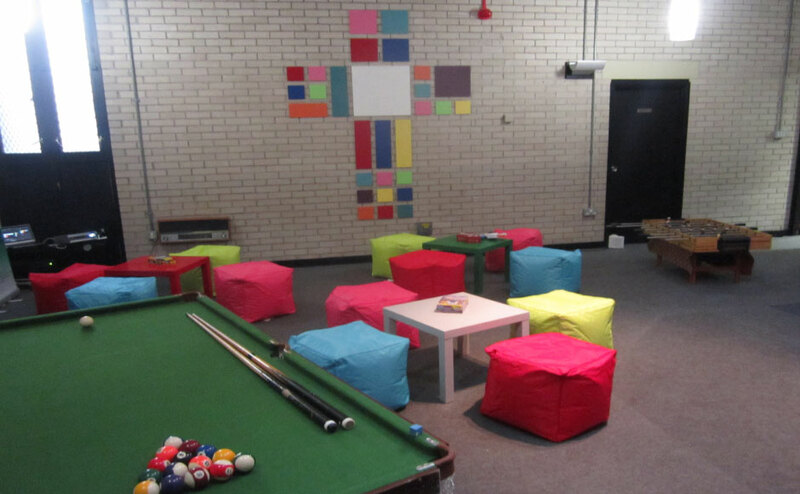 Each Sunday evening, The Space offers a pool, table football, board games and a place for good conversations. We serve free hot chocolate and a tuck shop is available. The aim is to build relationships. There have been around 10 young people have attended each week, in addition to the team of six young people who run The Space. Three of us are doing this as part of Duke of Edinburgh or Saltire award schemes. We had originally thought about a P7-S4 age group, but changed this to P7-S2 to be more targeted. After having been open a couple of months, we feel we should extend the age range back to P7-S4 as some people have said they have friends who want to come. The young people coming along attend regularly, but we need to improve our advertising so that more people know about The Space. Making use of the advertising screens in the already busy Lanthorn Centre is our first step towards this. The young people who come are from five different schools, and The Space has been a very successful way of them getting together and making new friends. Members of the school chaplaincy team have come along a few times so that the young people get to know them better. As well as The Space, since our work, the Lanthorn Chapel has been used by the congregation to run Safeguarding Training, for school visits and will be used for an evening service on Advent Sunday, showing we have made it a much more inviting and multipurpose space. We will work on promoting The Space so that more people know about it. We are going to begin a short ‘forum’ session once a month to give all the young people attending the chance to get involved in making decisions about The Space. We need to make some adaptations to the tuck shop space, as some of the shelving is not as sturdy as we thought. Next year is the 50th anniversary of the church and we are thinking about ways that The Space could get involved in the celebrations, with a ‘Battle of the Bands’ being a possibility we are looking into. The team running The Space is starting to plan to help run a children’s holiday club next year. 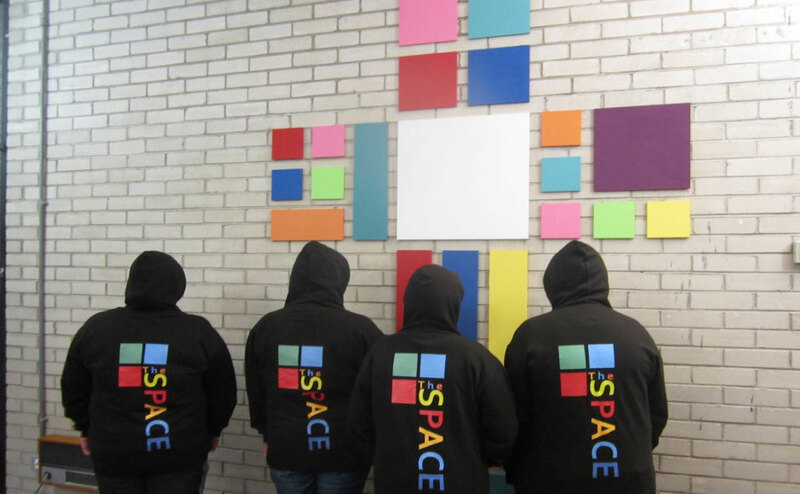 The Space is run by six young people: Rachel Blaber, Caitlin Galloway, Lewis McCreadie, Megan Alexander, Aaron Irving and Mairi Dalgleish. We have a rota of six church members who also help, along with our Youth & Children’s Worker. I’ve been involved in the youth work at St Leonard’s Church in Forres for a while and over the last year in particular have been cultivating relationships with other agencies such as the Moray Council. In the lead up to the Easter Holidays, council led provision for the school kids had been pulled from Forres. One of the local councillors in Forres contacted me to inform me of this news at meeting consisting of the two of us and the minister of St Leonard’s. It was decided that the church would run a “Fun Week” during the holidays and the ball started rolling to get something sorted. I made contact with the Moray Council youth workers and other local churches to scare up some helpers to run the week. 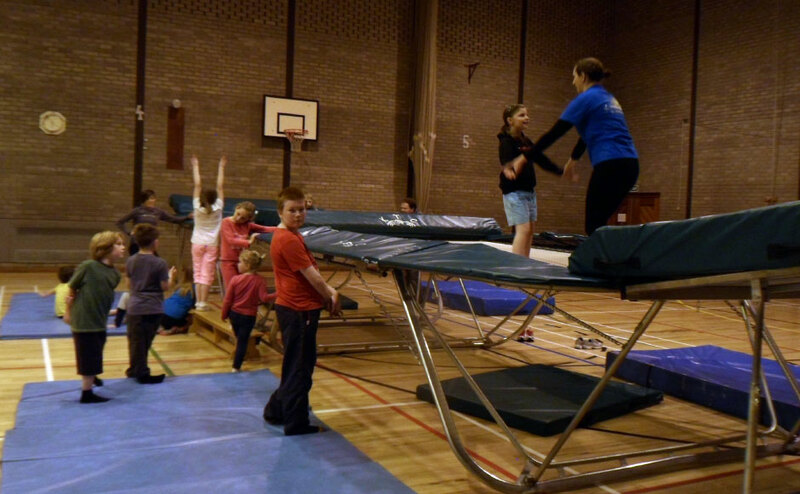 A meeting was set to plan the week and was attended by the senior youth worker in Forres, the leader of the Sunday School at St Laurence’s Church, Forres (also a leader in the St Leonard’s Church TFT’s) and a local trampoline coach. A rough plan for the week was created and the materials, resources and everything else we needed was starting to be gathered. Each day, apart from Friday, followed a very similar programme. The children would arrive at around 9am for registration and proceed to the upper games hall for juice, biscuits, crafts or games. At half 9 the children would be split into two groups. One to do games, one to do crafts. At half time they would receive a snack then watch a small drama. The drama was set in space but linked in also to the story of Peter. Then a small sketch to do with Peter was acted out for the kids and the relevant Bible passage would be read as well. After the drama was done the groups would then swap over. At the end of each day the two groups would come together and we would have a song or two just to finish off and also get the parents involved. Wednesday we had the added bonus of the local trampoline coaches doing sessions with the children which they all absolutely loved. It provided them with something new and something exciting for them to experience. The craft on the Thursday was some good old fashioned egg painting. This idea arose from some children saying they had never painted eggs at Easter and rolled them. Come the Friday afternoon we took the children out to a local park and rolled them down a hill. This provided much laughter and fun for the children, and also provided a good opportunity to teach them about the Risen Lord. We also managed to our games outdoors which was an added boost as well. Also on the Friday, we did a short Easter Egg Hunt with one of our leaders dressed as the Easter Bunny. Another highlight from Friday was a short sketch about the true meaning of Easter using the characters from Horrid Henry. At the end of the week we gave the parents evaluation forms to fill in and also an invitation to the church service on the Sunday to round off the week. Some of which actually turned up which was a good sign. In total we had 53 children on our register with an average turn of 27 children each day. Due to holidays and other activities taking place during the Easter break, some parents did tell us that some days their children would be elsewhere. On the whole the project went very well. We had a good turn of children with our lowest attendance being 24 and everyone seemed to enjoy themselves. We received good feedback from the parents (see attached) and the town of Forres was buzzing with stories about what was happening with the Fun Week. As you can see from the parent evaluation forms, the children had a great time. And the staff too probably. We received a great write up in the Forres Gazette about the Fun Week and I have been asked many parties, including parents, children and the local councillors, if I will be running something similar during the Summer Holidays. We also received some evaluation from the children regarding the Fun Week with a small survey which involved running around. Again, the feedback was good. A minority didn’t like the games or the crafts but of course, this is down to individual taste. All loved the trampolining and all said they would return again, which I’m taking as a good sign. What didn’t work well was the time in which I had to plan the whole week. I was only given about three weeks notice to plan it all out and so sometimes it affected the schedule for the day i.e. running over the time allotted or finishing activities too quickly. This added an extra bit of pressure but fortunately I had plenty of filler activities at hand just in case. Over all, based on feedback from children and parents, I think the Fun Week was a great success and I’d happily do it again. Since St Leonard’s Church already runs a fun week during the summer for Primary School children, I do not feel the need to organise another one in a similar style during the Summer Holidays. However, I have already been in contact with a few people in regards to creating an activity week for an older set of children. Possibly higher primary into early secondary. It is still very much in the early stages of planning so I would not like to comment further. The idea of it will be to have it more outdoors and a bit more physical. So let’s what the future holds!